Leading Manufacturer of pvc double wall corrugated pipe from Gurgaon. 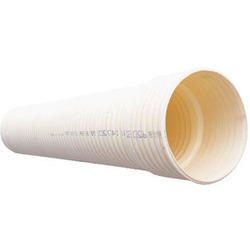 We are manufacturer of PVC Double Wall Corrugated Pipe. China Lesso has 30 years of experience in production and R&D in the pipeline field, becoming one of the earliest enterprises which can supply pipe and fittings products in China. At present China Lesso has more than 3,500 sets of production equipment in the field of pipelines with annual production capacity of over 2,000,000 tons.The size of products are available from 16mm to 2400mm. These products are widely used in water supply, drainage, power & communication,gas, home decoration, floor-heating, fire protection, agriculture and etc.